Import and export products and variations straight from WordPress admin. 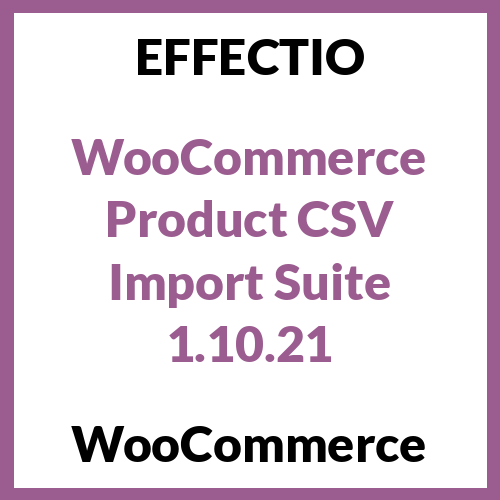 Go to WooCommerce > CSV Import Suite to get started. 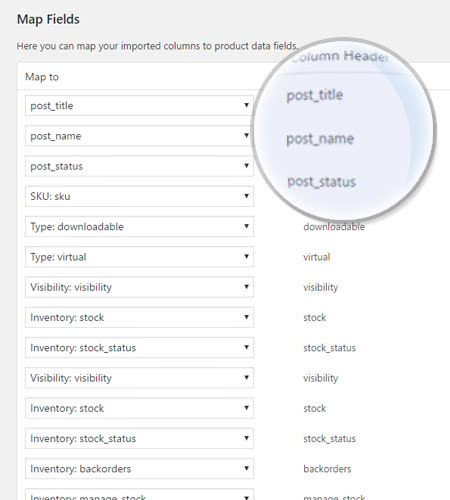 Supports post fields, product data, custom post types, taxonomies, and images. 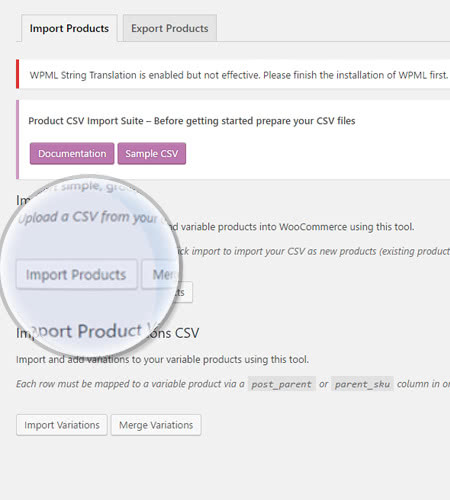 WooCommerce Product CSV Import Suite enables you to import, combine, and export items and item variations to and from WooCommerce using a CSV file. 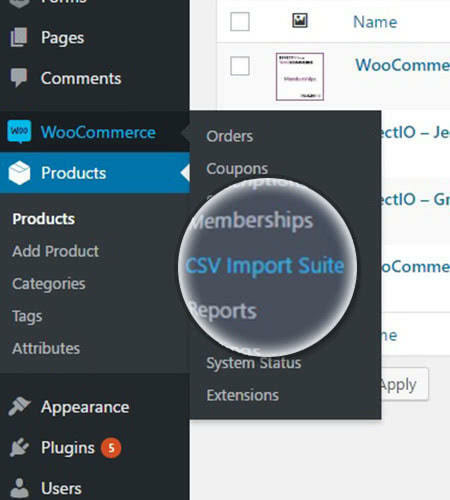 Plugin CSV Import Suite goes beyond the standard import/export device accessible in WooCommerce to support more extensions, such as WooCommerce Bookings, WooCommerce Photography and Google Product Feed. After installing the plugin, you can find it listed in the WooCommerce Options Panel. Just click on it to start importing your products! You can either create a new CSV using a sample .csv file or import an existing one. The last step of importing a csv file is checking that the column headers are mapped to the correct field. After finishing your job importing the CSV and mapping all your fields, you can export a new, reimportable csv file. This is a user-friendly importer, with clear instructions that help you import: Categories, Tags, Products and other Product details. Import text based product data, such as prices, descriptions, images. Import custom fields (meta), taxonomies, attributes and more. Merge products. This feature is very useful for adding more information to existing products. Extra flexibility for remapping your fields after uploading your CVSs. Make use of your personal CSV with any detail you would like to include. If you utilize the built-in WooCommerce tool to export a CSV, it already uses the schema and is ready to use. The blank and formatted CSV file also uses the schema, but you have to be sure to enter the info as it is instructed at Product CSV Import Schema. Product CSV Import Suite is much more than the basic import/export tool that you can find in WooCommerce. This plugin supports more extensions, such as WooCommerce Bookings, WooCommerce Photography or Google Product Feed. Product CSV Import Suite catches custom field details, without demanding custom code, so you can include extra information in your imports and exports. Furthermore, you can import details into any custom taxonomies, so you can add or update all the information about your items. If you have a lot of items in your shop, you may face some difficulties with exporting all of them at once. 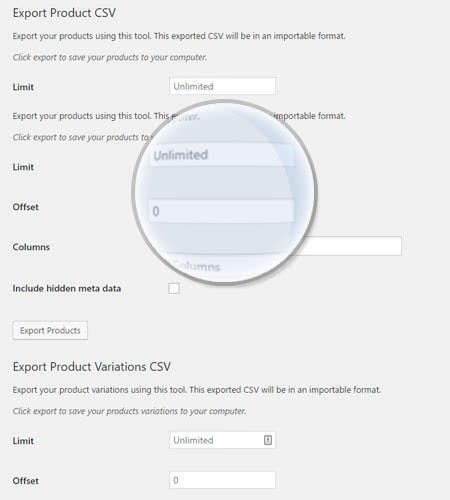 With Product CSV Import Suite, establish a limit on how many you’d prefer to export, or skip exporting the first X rows of products, in order to make your exports more controllable. Want serious discounts? Join the EffectIO Member Club. You’ll get this plugin and access to every other plugin on effectio.org for just $17.99 a month. Includes updates as released. Automatic Updates. Cancel anytime! Why are we so affordable? Our products don’t include premium support. That means we can offer up to 90% discounts on must-have commercial WordPress plugins. If you are a beginner and do need commercial support, consider getting one of our Care Plans. We’d love to hear from you! To enable faster answers from a help agent, please login first (or create an account and login) and fill out a support ticket.